As limoncello is to Italy, so Sipsmith Sloe Gin is to England. It had been nearly 90 years since a new Gin distillery had popped up in London … not since Beefeater in 1920. Why? Because a bizarre set of regulations with regard to still size and such prevented startups, meaning that the homeland of Gin itself was bereft of three generations of growth, diversity, and innovation (Ginnovation?). It seems that government mucks things up everywhere. But then a few years ago in the middle of the economic crisis, almost inexplicably, British law got a bit out of the way and a bunch of craft distillers jumped once more unto the breach, with the good folks at Sipsmith leading the way! And they did it right. The founders of Sipsmith are genuine experts and they love great Gin and great cocktails. They bought their first still—a small batch copper beauty they named “Prudence” after the economic policies that opened the legislative doors for them. Sipsmith now has three stills—all of them copper, all small batch, and all perfectly tuned to making their great, signature London Dry Gin and the rest of their expanding product line; including over-proof Gin, Sloe Gin, sipping Vodka, Damson Vodka, and more. 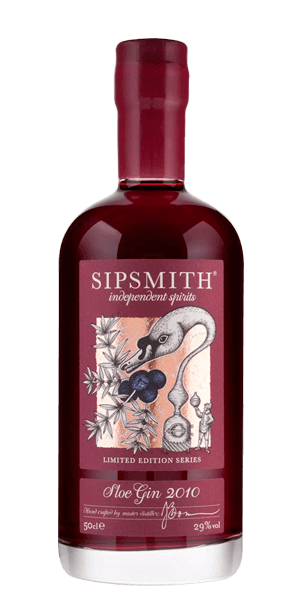 Sipsmith Sloe Gin is a beautifully crafted, luscious Gin sweetly infused with the perfect balance of fruit. Want to impress that little hottie on a first date? Order up a gourmet cheese and charcuterie plate and skip the wine. Pour a chilled cordial of Sipsmith Sloe Gin instead … or step it up to a Sloe Gin Negroni cocktail and you might find that, as the evening progresses, the pleasant conversation turns decidedly more pleasant indeed. Sloe drupes are the fruit of the blackthorn—native to England. The Sloe is a decidedly less delectable relative of the Plum. But it has become a hero of Britain because its complex flavors, subtle sweetness, and astringency sing in perfect harmony when infused with great Gin and a bit of simple syrup. Try it once and it will gain a permanent slot in your bar inventory for drinking neat or mixing into amazing craft cocktails. What does Sipsmith Sloe Gin taste like? The Flavor Spiral™ shows the most common flavors that you'll taste in Sipsmith Sloe Gin and gives you a chance to have a taste of it before actually tasting it. All of the botanicals you expect in Gin plus a hint of cherry and anise. Dry, with a subtle sweetness … pallet-cleaning and refreshing. Never really had a great Sloe Gin, and this Sipsmith was great for me. a good after dinner tipple and nice addition to my Gin shelf! Way too syrupy. I think I'll stick to a much dryer gin.